Congratulations to Colin Dacey our new RS700 Inland Champion! Ten of the Nation’s finest RS700 sailors made up the fleet for the RS700 Inlands at Queen Mary Sailing Club. With a changeable forecast which proved disappointingly accurate we endured just about everything over the two days from no wind abandonment to 25 knot 'hee-haw' carnage. The first day was very light. Robbie Bell led from the start of the first race continuing his form from the Europeans. He was chased by Spike Daniels and James Bayliss. James rounded the top mark with Colin Dacey but in a crafty overtaking manoeuvre James hoisted his kite, sailed over the top of Colin taking his wind and left Colin floating inside the spreader mark, have to drop his kite to tack to get round. In a typically flukey inland breeze with big shifts all over the course places changed up and downwind. James Bayliss nearly rounded the last leeward mark in the lead but got too close and ended up doing a turn. This allowed Spike through for the win and Robbie for 2nd with James recovering for 3rd. In the 2nd race Matt Carter led for two laps chased by Robbie and Colin before the wind shifted 90 degrees and dropped to nothing so the race was abandoned. Disappointed the race had not been finished at lap two the fleet went ashore with teddies thrown clear of cots only to see the wind shift and pick up. The fleet launched again with their tails between their legs for race three. Race three started in slightly more breeze Robbie and Colin battled for three laps for 1st and second respectively and James Bayliss sailed past Matt Carter who decided to fix himself to the leeward mark by his leeward rack on the final rounding. On day two the fleet launched in a light Northerly wind. By the time the first race signal sounded 15 knot gusts were crossing the course. Spike lead from the start and wiggled away from the chasing pack. Colin and Robbie followed close behind. By the end of the first lap the gusts were hitting 25 knots and the smiles turned to fear stricken gurning. One after another the leaders were flattened by savage gusts. This allowed Matt Carter to sail through the fleet with the leaders looking on from their daggerboards. Matt stayed ahead until the final leeward rounding where 10 yards from the gate he too was flattened by a gust. Robbie was just behind to take advantage (despite a further two capsizes within 10 boat lengths). 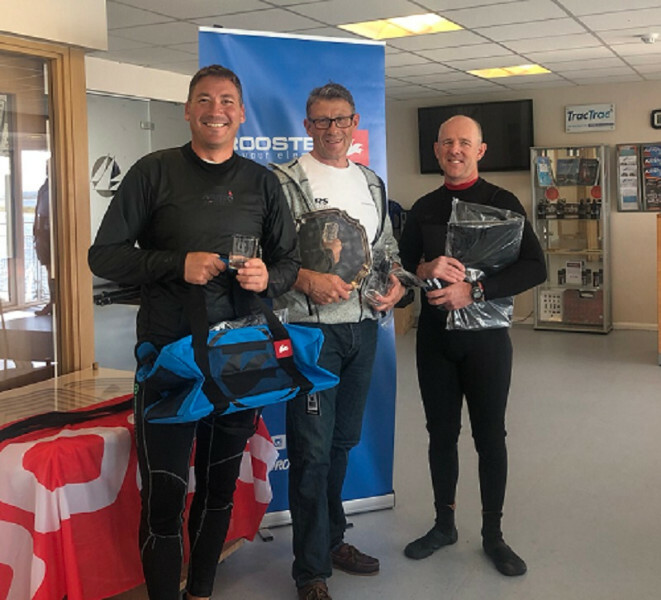 While Matt struggled to right his boat Robbie recovered first and managed to bear away through the gate and sail on to win while Colin, having recovered from his swim, flew through to second. The race for third saw James Bayliss beat Matt by a boat length on the line. Roland Smith, Stephen Carr and Jack Napolitano retired and recovered to shore. Seven boldly started the second race but with gusts still screaming through only four finished. James smashed his knee and had to be taken in by the safety crew, while Hamish battled round and retired halfway through having completed the beat but thinking a shower looked more appealing than the ride downwind. Colin and Spike battled all the way round with Colin taking the win, Spike 2nd and Matt 3rd. Robbie retired with a broken bridle but, not easily defeated, came back for race three. Race three again saw Colin battling with Spike and Graham Blake. Robbie had made his bridle too long so was reaching upwind and soon got bored and retired. The wind became very inconsistent shifting wildly and gusting from one to 18 knots. Colin kept his nerve to take the win ahead of Graham who just pipped Spike on the line. The race officer held a final race for the intrepid four. Spike lead with impressive upwind speed jostling with Matt for the lead. Colin got his own course long gust for the final downwind leg and blasted through to second. Spike just remained ahead to win with Colin second and Matt 3rd. Overall Colin came out on top as Inland Champion. Spike was 2nd with Matt coming 3rd. It was a great event with plenty of thrill and spills. Many thanks to Rooster for sponsoring the RS700 National Tour.